Everyone has strong food memories around holidays or special occasions in their life. I can completely recall the distinct taste of boxed cake from my childhood birthdays. Summer vacations were steeped in melting grape juice popsicles made by my grandmother. And one of my favourite treats during Christmas, was undoubtedly Turtle chocolates. The iconic striped box was always within arms reach during the holidays, so as soon as the tree went up, it was like a Pavlovian response…the Turtle cravings began! If you live outside of North America, you may not be familiar with these pecan-chocolate-caramels (and for this, I feel very sad for you), but today, rejoice! I’m posting my own version, which is a healthier spin on this classic candy that you can whip up yourself with just six simple ingredients. The original Turtle candies are relatively basic: pecans, caramel, and chocolate, but seemingly so much more than the sum of these parts. There is a magical synergy in this trinity, each ingredient complimenting and highlighting the others in perfect union. There isn’t much to improve upon, so my mission was clearly to health-ify the caramel and find some high-quality chocolate to steer us all away from refined sugar, modified milk ingredients, and emulsifiers. Blech. I started off on my journey by looking online and found that healthyish Turtle recipes exist, but they all use dates and I didn’t want that to be the predominant flavour. Plus, I knew that the caramel needed some serious creaminess, so I started by blending up cashew butter with vanilla as the base, then added brown rice syrup to achieve that distinctive gooey-ness that makes Turtles so crave-able. The results were sooooo right on the money, confirmed by several of my closest, discerning friends, lined up to taste test. 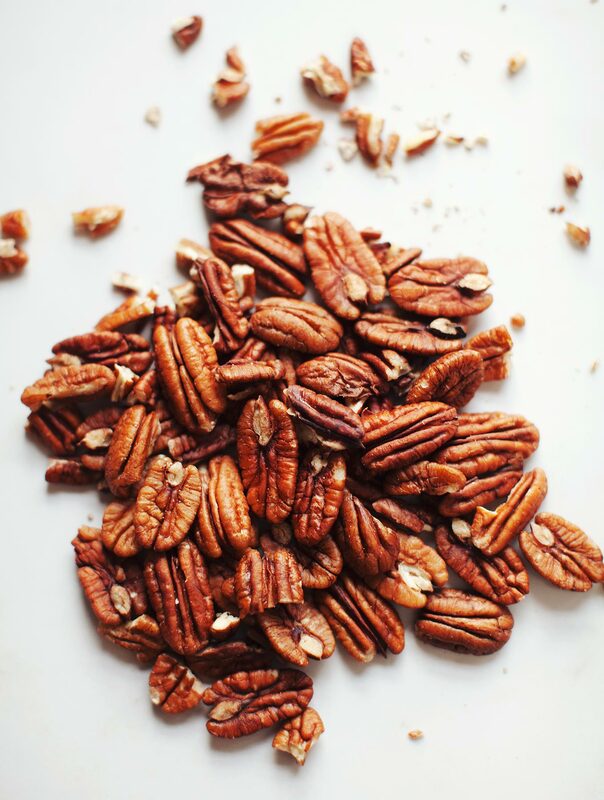 Pecans are one of my favourite nuts because they are tender-crisp and so naturally sweet. I love them in baked goods like pecan pie, on top of waffles or pancakes, or in candies like these babies! Pecans are native to North America, and grow in tough, wood-like shells on large, sprawling trees, some of which can live up to 200 years. The name pecan is a Native American word used to describe nuts that require a stone to crack – but you can easily open them by crushing two of their hard shells together. Along with macadamias, pecans contain the lowest amount of protein (5-10%) and the highest amount of fat (80-95%) of all the nuts. The fat that they do contain however, is mostly monounsaturated, with some polyunsaturated fat as well. Pecans are high in minerals, like manganese, copper, and zinc. They also contain a good amount of fiber and protein. There are a wide variety of pecans, but if you live outside North America, you may only have access to one type. That’s okay! The thing to look for is shelled pecans that are uniform in size and colour. Check the date on the package or bulk bin, and smell the nuts beforehand if you’re able to – they should be sweet, and well, nutty. If you’re shopping in bulk, visit a shop that has a high turnover to ensure that the nuts are fresh. 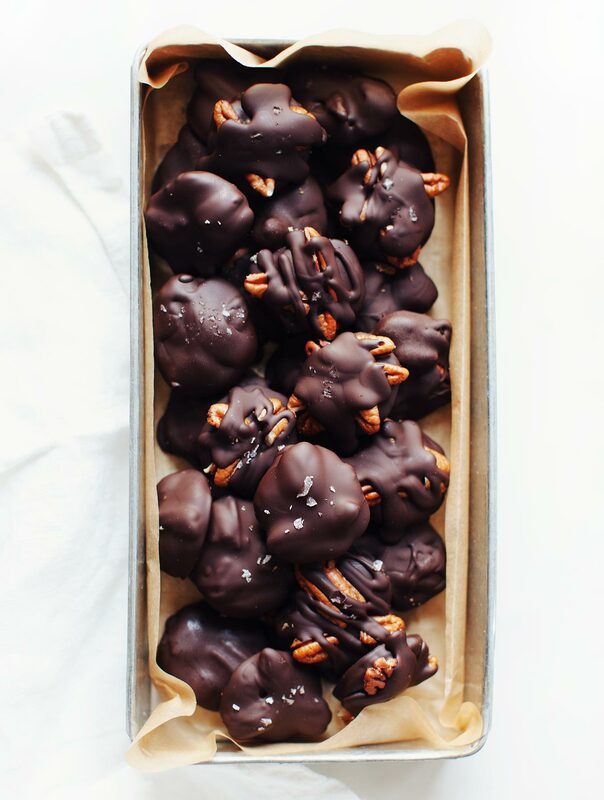 Once you get them home, store shelled pecans in an airtight container at room temperature for up to six months (although try to eat them sooner) and in the freezer for up to a year. Pecans are highly susceptible to absorbing other smells, so keep them locked up tight in glass to prevent them from tasting like garlic, onions, or last night’s casserole. I had hesitations about using brown rice syrup in this recipe, since I know it’s one of those harder-to-find ingredients, but it’s just SO perfect in this context that I had to! If you cannot find brown rice syrup, try whipped or creamed honey in its place. I recognize that this isn’t an alternative for vegans, but I think it is the only sweetener that would work due to how thick and viscous it is. If the caramel is too runny, if will be impossible to work with. Trust. It’s best to store your Turtles in the freezer, and take them out about 10-15 minutes before serving. They’re also fine at room temperature, but will keep better cold. I actually dig them a little on the frozen side – the caramel is extra thick and chewy at subzero temperatures! 1. Find a baking sheet or tray that will fit in your freezer, then line it with parchment paper. 2. In a medium sized bowl, stir together the cashew butter, rice syrup, vanilla and flaky salt until thoroughly combined. Taste (yum), and adjust the saltiness and vanilla levels to your liking. 3. Scoop a teaspoon of the caramel onto the lined baking sheet, using another spoon to help remove it – this stuff is seriously sticky! 4. 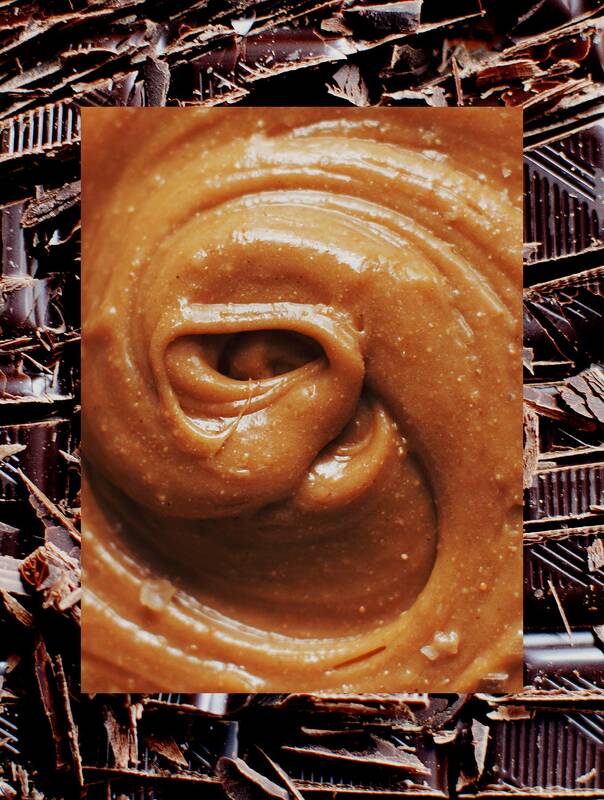 Press a whole pecan on one side of the caramel blob, allowing the nut to peek over the edge just a bit, then add two halves to the sides, peeking over the edge just a bit too. Repeat until you’ve used all the caramel. Place in the freezer for at least one hour, up to 24 hours. 5. Once the caramels have chilled, prepare the chocolate. Heat a few inches / centimetres of water in a small pot and heat on high. Roughly chop the chocolate bar into small chunks and place it in a heatproof bowl. Lower the heat to simmer, then set the bowl over the pot of so that it is sitting well above the water itself. Stir occasionally until the chocolate has completely melted. 6. Remove the caramels from the freezer. One at a time, drop each caramel into the melted chocolate pecan side-down, flip and ensure that the top is entirely coated. Remove from the chocolate with a fork, and drag the bottom along the edge of the bowl to remove any excess chocolate. Place back on the lined baking sheet and sprinkle with a couple flakes of salt. 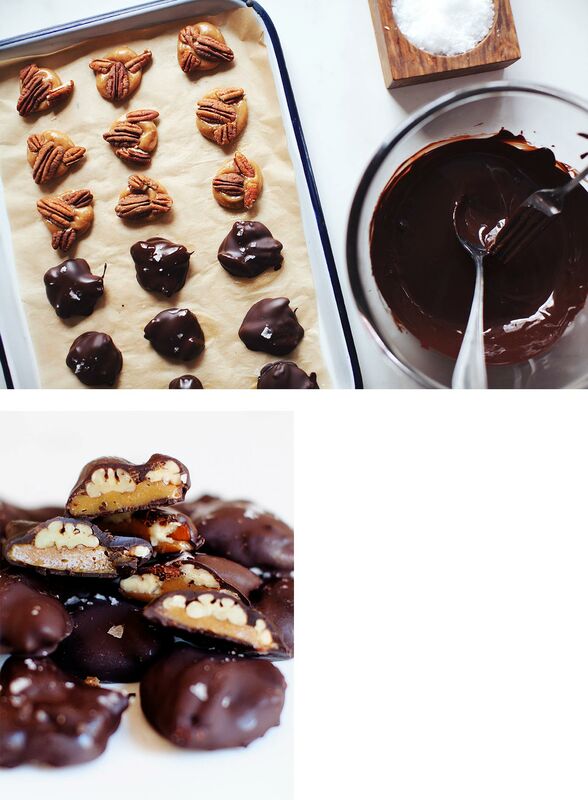 Repeat until you’ve coated all the turtles in chocolate. Place them inside the freezer until set, then transfer them to an airtight container and store in the freezer or fridge until ready to serve. 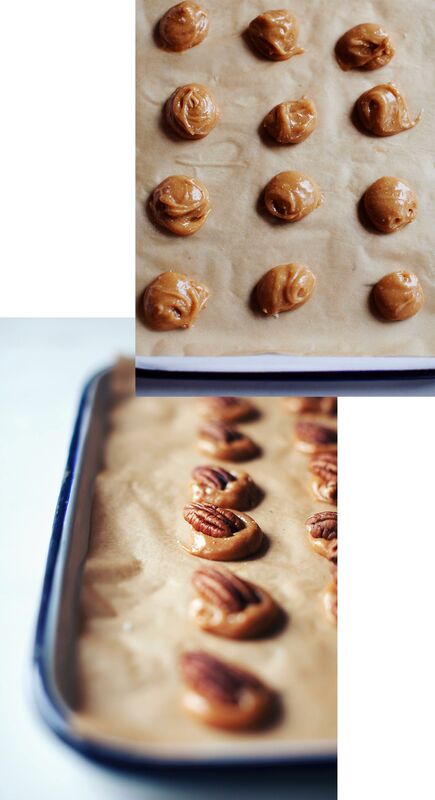 If you want to see some of the pecans, drop the caramels on their bottom side first, then remove and place on the lined baking sheet. Drizzle enough chocolate over the top to fully cover the caramel (if you don’t coat it completely, it may spill out at room temperature), but allowing a few parts of the pecans to show through. This will be my last post before the New Year, my friends! I’m off to Bali in a mere 10 days (!!!) and words cannot describe how excited I am for the Wild Heart High Spirit Retreat, and meeting women from all across the world. If you’d like to know more about my retreats, visit the Golden Circle Retreats website. We’re planning another round for 2019, so sign up to mailing our list to be the first notified when we announce the dates. We are also taking orders for the Life-Changing Loaf of Bread Subscription Box! What better way to start off the new year than with a delicious monthly gift of health to yourself? If you want to learn more, or place your order, visit the shop page here. All love from Canada, and happiest of holidays to you and yours!